The final comics sales estimates for January are out from Diamond Comic Distributors, and as reported here on Friday, the Direct Market began the year strongly, up 12%. Click to see the sales estimates for comics ordered in January 2015. As expected, Marvel's relaunch issue Star Wars #1 had sales that, when UK and February reorders are included, will put it over 1 million copies sold; Diamond shipped closed to 986,000 copies to North American retailers in the month of January. The lion's share of those orders were placed by comics ships, although one of the dozens of variant covers was for the repackager Loot Crate, whose orders would have been somewhere over 200,000 copies based on what we've seen in the past. Regardless, it's reasonably safe to assume the issue would have taken the century bestseller record based on comic-shop sales alone. The achievement has been added to the Diamond Exclusive Era records page, but there are a number of other things we can say about it that we don't normally keep categories for. The issue sold nearly nine times as many copies as its closest competitor, Batman #38; this doesn't appear to have happened since 1991, when X-Men Vol. 2 #1 — at 8 million copies plus, the best-selling comic in North American history — outpaced the second-place title, X-Force #3, by about the same factor. Further, the issue outsold the next 12 comic books on the charts combined — and, perhaps more impressively, sold as many copies as every comic book between 163rd and 300th place, combined. About every seventh comic book retailers ordered in the Top 300 was a Star Wars #1 — and the comic book alone represented 11% of Diamond's dollar sales for the month, if we look just at standard retail price. That's larger than everyone's market share but Marvel and DC. 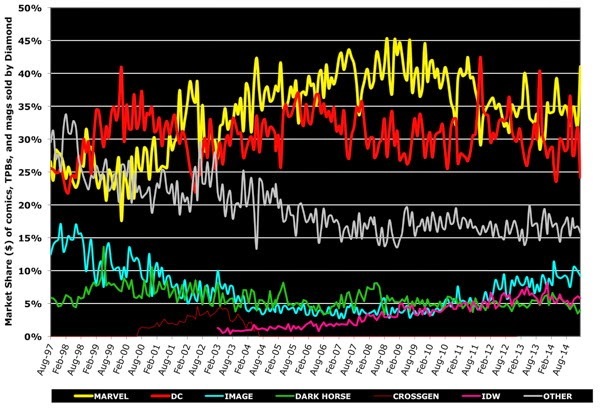 Comic unit sales were up 10% over the previous January, and the Star Wars issue accounts for all the increase and more, but it doesn't really work to make comparisons of the "without this issue" variety. 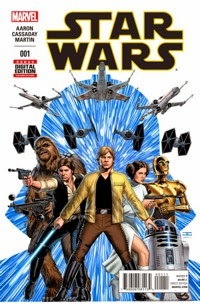 It's true that the approximately $5 million spent on this one comic book is slightly larger than the increase in the size of the overall market this January versus last January — but it's reasonable to expect some of those dollars would have been in the market anyway, and simply got rerouted to Star Wars #1. Graphic novel sales were up nearly 17% unrelated to the action in new comic books, so the market had strength in other places. The market shares across time charts have been updated for the new year; we now have a 17-year track, as seen above. The average comic book in the Top 300 cost $3.77; the average comic book retailers ordered cost $3.95. The median and most common price for comics offered was $3.99. Click to see comics prices across time. Some long overdue updates: the graphics on the Market Shares Across Time page has been updated, as have the Three-Year and Complete Diamond Era sales graphics reporting the performance of the business across time. And this month's update starts a new year of sales reports here on Comichron: we neglected to mention that last month's report completed 20 years of sales rankings on site, beginning with January 1995 at Diamond and Capital City. (There wasn't just one listing back then, as there were still several distributors.) More historical data on the way this year! John Jackson Miller has tracked the comics industry for more than 20 years, including a decade editing the industry's retail trade magazine; he is the author of several guides to comics, as well as more than a hundred comic books for various franchises. He is the author of several novels including Star Wars: Kenobi, Star Wars: A New Dawn, and the upcoming Star Trek: The Next Generation - Takedown, releasing January 27. Visit his fiction site at http://www.farawaypress.com. And be sure to follow Comichron on Twitter and Facebook!